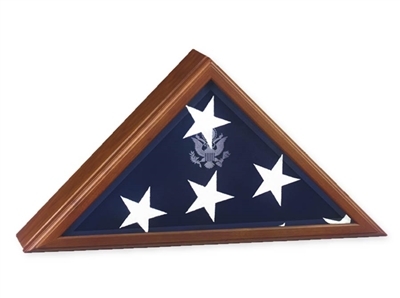 Proudly display the American burial flag of an outstanding statesman or a military personal with a presidential flag display case. Each dust-protected presidential flag case – made in the USA from solid walnut or cherry wood – bears a free three-line brass nameplate and a gold-embossed Great Seal of the US. The Presidential Flag Case is the choice of Presidents and Generals with the embossed Great Seal of the United States on elegant beveled glass. Heirloom Walnut or Cherry finishes with hinged lid, concealed magnetic closure and dust seal to preserve your flag. Solid wood finished back.